General view of Johnstone Castle. "Johnstoun, an old possession of the Nisbets, came from them to the Wallaces, continued six generations a house of good account, now decayed". 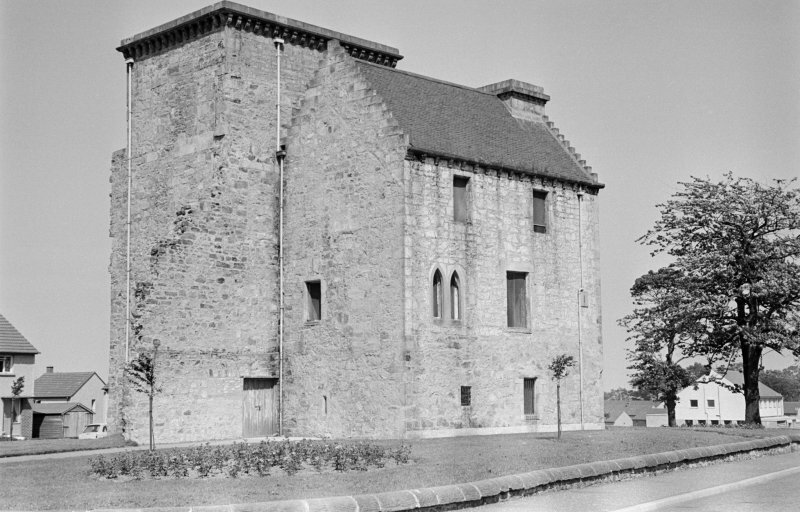 Johnstone Castle, now situated in a modern housing scheme, was originally named "Easter Cochran" and owned by the family of that ilk, its name changed in 1733 when it was acquired by the Houstons of Johnstone. they added to and altered the former mainly 16th century fortalice in the years that followed. Now that the estate has been taken over by the burgh, most of the extended mansion has been pulled down and only the original part is left, though much scarred by 19th century 'improvements'. It is now used as a store. 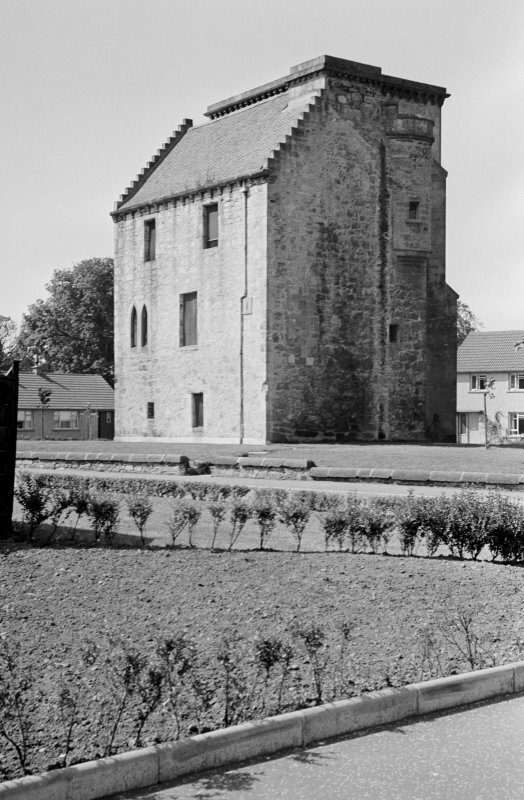 The castle as it now stands is L-shaped and consists of a comparatively little-altered main block of three storyes and a garret, lying E-W, with a wing, now built in the form of a massive Gothic tower, projecting N and rising a storey higher. Apart from two tiny windows at basement level, and others built up, the wing has been very much altered. The hall, on the first floor of the main block, has also been much altered, but still retains a garderobe and a very deep window embrasure, giving the impression of a nucleus older than the 16th century. See NMRS paper catalogue Strathclyde, Renfrew, H - O for photocopied cutting from Sales catalogue. Non-Guardianship Sites Plan Collection, DC28043 DC28046, 1960. 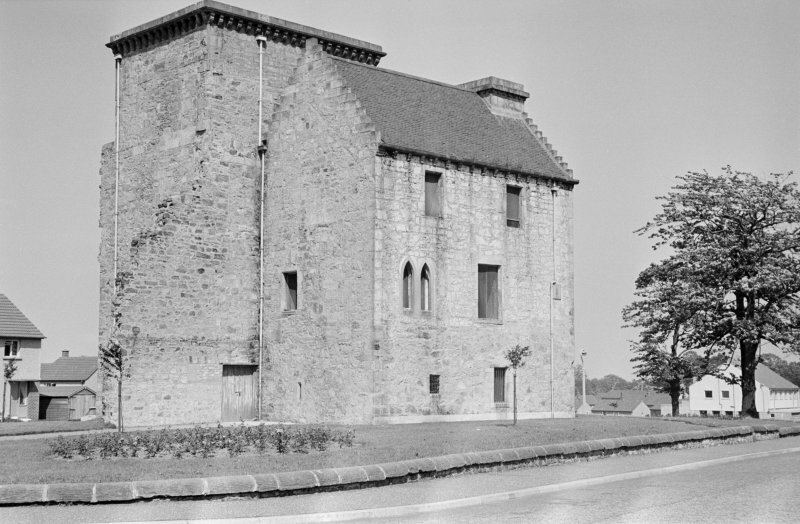 Photographic survey of Johnstone Castle, Renfrewshire, by the Scottish National Buildings Record in 1956. 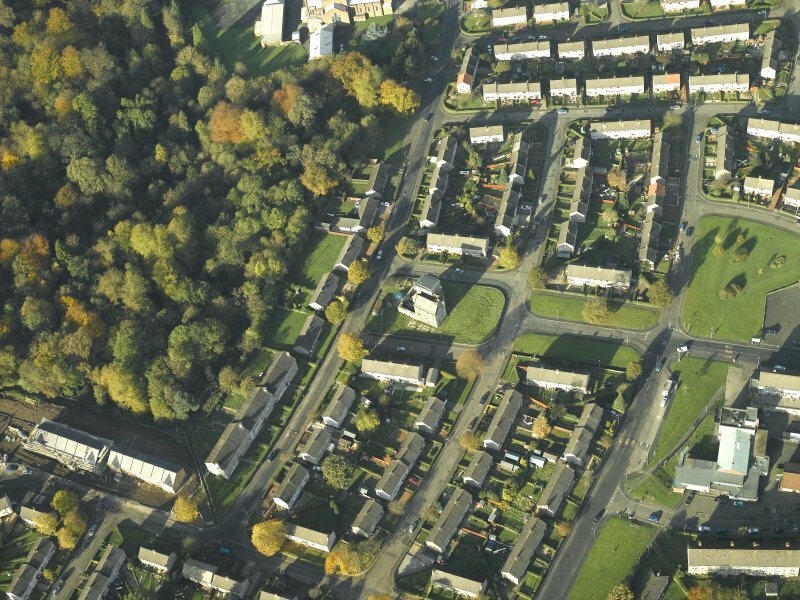 Photographic survey of buildings in Johnstone, Renfrewshire by the Scottish National Buildings Record in July 1963. NS 428 623 SUAT were commissioned by the owner of Johnstone Castle to conduct an evaluation in May 2004 of the castle grounds in the area of a proposed new barmkin wall and service trench. At the same time, the castle was to be the subject of a standing building survey (photographic, electronic and scale drawings) as a precursor to renovation of the interior. The evaluation found the grounds to be highly disturbed by modern or Victorian foundations and concrete platforms that are presumed to relate to the 19th-century additions to the castle, a large mansion house demolished in the 1950s. Services were also present. No features of archaeological significance were exposed. The standing building record showed that several phases of building, demolition and rebuilding had occured in the lifetime of the castle. 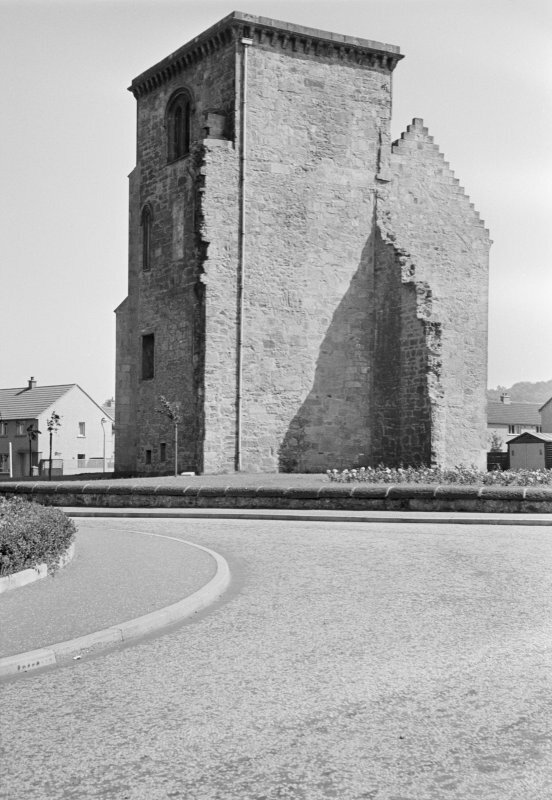 In particular, the original rectangular tower, having been extended through the addition of a crow-step gabled house, now exhibited several areas where vestiges of the mansion walls were apparent as raggle or heavily truncated connecting walls protruding from the faces of the remaining late/post-medieval core. Numerous doors and windows had been blocked up or otherwise modified, often presumably to accommodate the presence of the mansion, or more recently to remove entrances rendered redundant by the removal of the mansion. Several arrow slits and gun ports were still extant, along with decorative lancet windows and dummy machicolation moulding, however, and the post-medieval core was in general fairly intact.